Peter Jackson's film adaptation of The Hobbit was going to be a showcase for 48fps filmmaking but now it seems many won't get to see the technology. This is because Warner Bros is looking to only put out a limited run of 48fps prints of The Hobbit, in favour of the more conventional 24fps version of the movies. Jackson is pushing filmmaking boundaries with The Hobbit; he is currently shooting the movie at 48fps, the highest frame rate ever used for a mainstream film, but Warner Bros seems to be erring on the side of caution when it comes to showing the movie in this format. 48fps or HFR is being pitched as a new standard for filmmakers. Offering a higher frame rate means that blurring and flickering is reduced to pretty much nothing; perfect if you are shooting in 3D, then, but some critics who have seen footage filmed in this manner believe that the images shot are just 'too real'. This was an argument put across by those who saw a tidbit of The Hobbit at CinemaCon in April. There was a slight backlash against the footage shown which pushed Jackson to speak to Entertainment Weekly about the situation, where he said: "At first it's unusual because you've never seen a movie like this before. It's literally a new experience, but you know, that doesn't last the entire experience of the film – not by any stretch, [just] 10 minutes or so." He blamed the reaction on the fact that a montage of the movie was shown and reckoned when people see longer pieces of the movie, the 48fps frame rate will come into its own. According to Variety, however, sources close to the movie believe that The Hobbit in its true iteration will only get a limited run – although this may not be to do with the reaction the footage got. It seems that the technical changes cinemas have to make to show the movie in this standard may well be a stumbling block. At the moment, there's no cinema chain equipped to show the 48fps version of the movie but some will only need a software upgrade to be ready. The first Hobbit movie – of a mind-boggling three – will be used as a test bed for the technology and may not go out to all major cities. In some ways this is a good thing – Warner is invested in the technology and will push the technology but as for a mainstream rollout, it is more likely that the second and third movies will be shown in more places in 48fps. The headache Warner has is that to show the movie in 24fps, it will have to be down-converted which costs money. 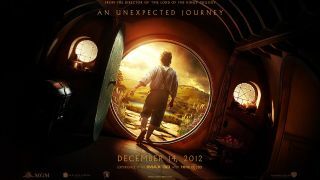 The Hobbit: An Unexpected Journey is set to hit cinemas 14 December.